Eczema Honey Reviews - Will It Ease the Symptoms of Eczema? Eczema Honey is a range of natural products designed to moisturize the skin, fight off infections, and reduce eczema symptoms for the long run. Eczema Honey Review: Will It Ease the Symptoms of Eczema? Beyond treating eczema, the creams can be used for psoriasis, dermatitis, rosacea, sunburns, shaving burns, acne, and general rashes or skin inflammations. The company also notes you can use their honey to take off makeup or as a lip balm. But what is eczema, and is there any scientific basis for using honey to treat it? Let’s look at the details. According to Medical News Today and the National Eczema Association, eczema is the label used for a group of skin conditions that produce red, flaky, and often itchy skin. The term comes from a Greek word ‘ekzema’ meaning “to boil over”- an apt description for the red flare-ups the condition is famous for. An estimated 30 million Americans live with eczema, and common types of the condition include atopic dermatitis, contact dermatitis, dyshidrotic eczema, nummular eczema, seborrheic dermatitis, and stasis dermatitis. While eczema is most common in infants and children, it occasionally persists through adulthood. Some adults also develop the condition, despite not having eczema as a child. What Are the Best Ways to Treat Eczema? Dermatologists still aren’t sure what triggers eczema in the first place, but it’s clear that the condition isn’t contagious. While looking through the previously mentioned research, we learned that eczema is considered to be incurable. Know your triggers, as certain foods, environmental pollutants, and skin care products can trigger outbreaks. Follow a regular moisturizing routine to keep the skin hydrated. Monitor for signs of infection so that you can address them right away. Beyond these prevention strategies, there are several accepted treatment options for controlling eczema flare-ups. The right eczema treatment for you depends on a variety of factors, including your age, medical history, and the severity of symptoms. According to WebMD, many people use prescription medications to control their symptoms, including corticosteroid creams, NSAID ointments, barrier repair moisturizers, corticosteroid pills, antibiotics, antihistamines, and medications to regulate the immune system. Beyond conventional medicine, many people turn to natural remedies for treating eczema. Specifically, Eczema Honey Co claims that honey can keep the condition’s symptoms at bay. Does this hold up to scientific scrutiny? Let’s look closer at the research. Does Honey Show Promise for Treating Eczema? According to Livestrong.com, honey has long been valued for its antimicrobial properties as a wound treatment. A 2013 literature review revealed clinical evidence of the compound’s abilities to heal wounds, thanks to its anti-bacterial, anti-inflammatory, and anti-viral properties. The researchers concluded that honey could provide equal, possibly even superior results when compared to conventional wound treatments. In regards to eczema, a 2003 study in Complementary Therapies in Medicine found that a topical ointment made from honey, beeswax, and cold-pressed olive oil could produce significant improvements in eczema symptoms. According to their results, more than 80 percent of the patients found that their eczema improved when they used the ointment. Another eczema study found that honey was potentially effective. Published in 2017 in Immunity, Inflammation, and Disease, the research showed that a Makua honey treatment significantly improved eczema symptoms in 14 patients after seven days of treatment. The initial research looks promising, but why does honey seem to have the potential to treat skin conditions? How Does Eczema Honey Work? According to the company website, Eczema Honey is a natural way to combat the worst parts of living with an inflammatory skin condition. Notably, they explicitly state that they don’t claim to cure eczema. Rather, they note that the product has worked for them personally and that many of their customers reported positive results both immediately and over the long term. They state that these easily absorbable enzymes bring moisture, vitamins, and fatty acids into the skin to stimulate tissue growth and minimize scar formation. Eczema Honey will also purportedly enhance epithelialization and form a natural lipid barrier to lock in moisture and protect the skin against both heat and dryness. Finally, the company notes that an enzyme in their honey known as glucose oxidase produces hydrogen peroxide, a well-known disinfectant that kills off germs and bacteria that trigger eczema. We found research in the Journal of Alternative Contemporary Medicine that validated these claims. What Products Are Available from Eczema Honey? At the time of writing, we found three products available from Eczema Honey. This standard product claims to blend natural ingredients to soothe eczema symptoms for long-term results that lead to fewer flare-ups and less redness. Ingredients: Organic Pure Honey, Organic Almond Oil, Organic Olive Oil, Organic Grated Beeswax, Organic Sunflower Oil, Colloidal Oatmeal, Pure Spring Water, and Optiphen. Similar in function to the original cream, this product is formulated in a commercial grade facility that doesn’t cross with the original healing cream, ensuring that there is no risk of contamination. Ingredients: Organic Pure Honey, Grapeseed Oil, Organic Grated Beeswax, Organic Sunflower Oil, Colloidal Oatmeal, Pure Spring Water, and Optiphen. Designed for those who need more than an eczema spot treatment, this oatmeal scrub can be applied in gentle circular motions across the skin and left in place for several minutes before rinsing it off. The blend of ingredients is purportedly designed to provide anti-inflammation, anti-itch benefits to soothe stubborn rashes. Ingredients: Epsom Salt, Colloidal Oatmeal, Organic Pure Honey, Olive Oil, Jojoba Seed Oil, Orange Oil, Lavender Oil, and Vitamin E.
What Can We Learn from Eczema Honey Ingredients? There’s a lot to unpack in Eczema Honey, so let’s look at the purported benefits of some of the most common ingredients. Honey: As previously stated, honey has proven antimicrobial and anti-inflammatory properties that make it effective against inflammation and the resulting skin conditions. Beeswax: Dr. Axe tells us that beeswax is rich in vitamin A and can lock in moisture for the skin while still allowing to it breathe. Almond Oil: Healthline states that almond oil is an exceptional source of vitamin E and that its moisturizing benefits are especially potent for people with sensitive skin. Sunflower Oil: According to Dermatology Times, sunflower oil has natural anti-inflammatory properties and can produce a protective barrier on the skin that reduces the potential for infection. Epsom Salt: Healthline tells us that Epsom salt is useful for treating skin conditions like acne and eczema, as it can reduce swelling and inflammation on the skin. Colloidal Oatmeal: According to reports from Dr. Axe, colloidal oatmeal is a form of finely ground oats that help the skin when used topically, thanks to its cleansing, moisturizing effects. One ingredient in Eczema oatmeal that might initially give you pause is Optiphen. While it might sound like a potentially troubling preservative, we found on Brambleberry that the compound is a paraben and formaldehyde-free preservative that is commonly used in natural cosmetic products. Since it’s not a true preservative, Eczema Honey products need to be refrigerated to stay fresh. What’s the takeaway from this ingredients list? While our research didn’t uncover many direct connections between the ingredients and eczema treatment (honey is the exception) these ingredients have well-studied benefits for improving skin health. At the time of writing, Eczema Honey is only available from the company website. You can buy the original or nut-free formula for $29.95 for four ounces, and the oatmeal scrub is available for $24.95 for eight ounces. It’s also possible to sign up for a subscription and received a jar of eczema honey every month (or every other month) automatically for a 15% discount of $25.45 each. The company states that you can pause or cancel your subscription at any time without paying a penalty. According to the company website, all eczema honey products are handmade in the United States. The brand strives to provide you with the freshest product possible, which means that the creams are often made only after ordering. Processing typically takes place about one or two days after ordering, and you’ll need to wait for shipping after that. All further questions can be directed to the company through their contact page. What Are Other Products for Treating Eczema? Considering the well-researched benefits of honey for eczema, it’s hardly surprising that there are other honey-based eczema products on the market. Does Eczema Honey Co stand out from the rest? We choose to look at two different products to find out: E-ra Organics Relief Moisturizer and Yoro Naturals Organic Manuka Skin Soothing Cream. The E-ra Organics moisturizer is an all-natural moisturizer that’s designed to provide long-term relief for dry, cracked, and itchy skin. The company suggests using it to treat eczema and restore the skin’s pH levels. Despite also being an all-natural formulation, the cream contains different ingredients than Eczema Honey products, except for honey and olive oil. Instead, it contains hemp seed oil, shea butter, coconut butter, and others. Customers seem to like E-ra Organics, as it averages four stars on Amazon after approximately 1,300 reviews. Many people commented that it made a significant difference in their skin conditions and worked better than prescription products. Pricewise, you’ll pay $23.87 for four ounces, compared to $29.95 for eczema honey. Yoro Naturals also captured our attention as an all-natural eczema treatment. Advertised as a gentle skin solution for sensitive skin, the Manuka honey cream is advertised just as much as a treatment for diaper rashes as an eczema solution. 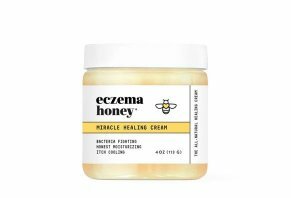 Unlike Eczema Honey, this cream is made from only certified organic ingredients, which might be a selling point for those with sensitive skin. Amazon customers gave it four out of five stars after 300 reviews, and you’ll pay $24.95 per two-ounce container. If you’re dealing with chronic eczema, what treatment option is best? Healthline offers some suggestions that range from a colloidal oatmeal treatment to coconut oil, acupuncture sessions, and even relaxation techniques. The takeaway is that the cause of the inflammation that triggers eczema flare-ups can be multi-faceted in its origins, meaning that you might need to experiment with multiple remedies before you find one that works for you. The majority of Eczema Honey reviews available online can be found directly on the company website. We found evidence of dozens of overwhelmingly positive reviews (along with pictures) that proclaimed how well the products worked for individuals with skin conditions. We noticed that several users commented on how concentrated the cream was, noting that a tiny bit went a long way. Others loved that the products weren’t scented, as this meant that there weren’t any added fragrances that could potentially irritate sensitive skin. A few people appreciated that the cream melted directly into their skin on application and that it didn’t feel sticky to the touch. One reviewer even noted that the cream worked on her golden retriever’s skin conditions. A review on Amybethcampbell.com noted that it was critical to leave the product in the fridge when not in use, as hers developed a tiny bit of mold when she left it out for too long. Another review on Becausemomlife.com was sure to mention that the product couldn’t cure eczema, though it did an exceptional job of keeping the symptoms from being overwhelming. Our View: Should You Try Eczema Honey? Though we haven’t tried this product for ourselves, our look at the researched benefits of honey for treating eczema and the website’s testimonials show that Eczema Honey is a product worth a second look. The cream won’t cure your eczema (and it doesn’t claim to), but it can keep your skin moisturized and healthy, which consequently reduces your risk of developing eczema-related rashes and flare-ups. The ingredients list for eczema honey offers little reason for concern, as the three products encompass all-natural ingredients that shouldn’t trigger reactions in sensitive skin. Honey, the primary component, is proven to be helpful for treating skin conditions, and it won’t feel tacky on your skin. If you’re struggling with a skin condition, it might make sense to give Eczema Honey a try. However, it’s best to consult with your doctor about your skin condition to confirm that it is eczema before experimenting with treatment options. Not all rashes and irritations are caused by eczema, so it’s best to get a proper diagnosis before beginning. Write a Review for Eczema Honey!